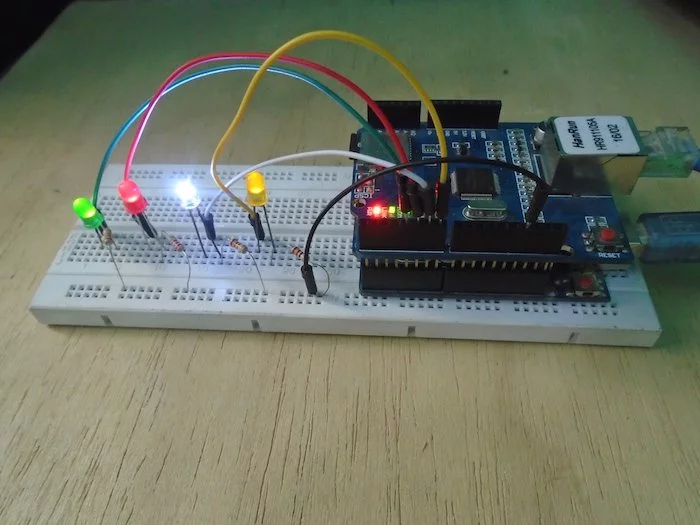 Use an Arduino ethernet module to control LEDs through a webpage. In this article, we are going to control LEDs from a web page using an Arduino Ethernet module. The Ethernet module will create a server using the router and we will set a webpage for this server. We will use the HTML commands to print the data and to make the buttons on the webpage. When the button on the webpage is pressed, we will get some data on the serial monitor. We will save this data in the string and will use this data to turn the LEDs ON or OFF. The circuit diagram is very simple. Connect the positive pin on each of LEDs to pins 7, 6, 5 and 4. Then connect the other end of the LEDs to the ground on the Arduino through the 220-ohm resistors. Before uploading the code, change the LAN IP with your LAN IP and gateway IP with your gateway IP. Then Upload the code and open the serial monitor. It will show you the IP address, enter this IP address into your browser and a web page like below one will get open. Now the LEDs will turn ON or OFF upon pressing the buttons. Arduino Web Page LED Control Zip file linked here. First, we included the libraries for the Ethernet shield and then initialized the pins for the LEDs. Then we added the physical mac address for the Ethernet shield (No need to change it.) Next, we give the Lan IP at which we will create the server and then we give the gateway IP and subnet mask. Next, we selected the port ‘80’ and initialized a string for storing the data from the webpage. In the setup function, we declared the LED pins as the output pins and started the server at the IP we give in the above lines of code. In the following part of code, we send the HTML commands to create the button and to print the data on the webpage. We stop the connection to the server and get the data from the webpage. Next we compare the data and turned ON or OFF the LED’s.